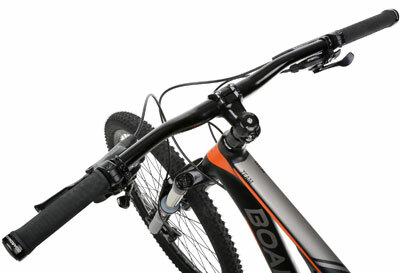 The Boardman Team FS was awarded 4.5 stars in a 2011 review in What Mountain Bike for its value, and has a similar star rating from its riders, so what makes this bike so worthwhile and does it have any faults? What advantages does this Boardman Full Suspension Mountain Bike Team have and can it offer the high performance it promises? The first aspect of this model that should be mentioned is that buyers really do believe it has a great specification that offers value for money. The quality of the components has surprised many people considering the bike’s cost and their online testimonials heap praise on a number of features. Three that are noteworthy are the lightweight aluminum frame, which has been frequently commented on for its positive nature; the RockShox suspension system that provides a comfortable, hard-hitting ride; and the brakes, which were apparently designed for all conditions and seem to live up to these expectations. This impressive specification and the desirable parts that create it mean the kind of performance that many riders expect from the brand. The full suspension mountain bike was designed for an enviable off-road performance that buyers could rely on and, from the customer reviews, it appears that they have been able to fulfil this promise. The bike’s abilities as an off-road model are not in question because of the capable suspension, the speed that the lightweight frame allows and the great grip of the Continental Mountain King Tyres. What makes this performance so appealing is not only does the bike have the ability to tackle tight corners and tougher terrain, it does so with such ease and reliability that buyers find they have even more confidence and a greater desire to test the bike to its limits. Thankfully, this new attitude and increased use is not hampered by the durability of the bike and there are no complaints about it being worn out. What flaws does this Boardman Team FS have that may limit its appeal? The only real issue with this Chris Boardman bike, apart from a couple of comments about the gears, is the way that it looks – and even then this is not a completely negative aspect. The biggest complaint is a little superficial because it involves the white grips and saddle and the way they show up the dirt. This is not a massive flaw in any way but it is frequently highlighted as a strange oversight on a bike of this nature. Overall, the look of the bike divides opinion because while the choice of white is an issue, many people complement the clean lines, style and finish that make it look more expensive than it actually is. It is also worth noting that there are some reviews that are much more negative and bring down the overall rating; however, prospective buyers should be aware that these have a lot to do with the quality of the build at the chosen retailer rather than the bike itself. Summary: should you opt for a Boardman FS Team Bike? There is one factor that stands out across this review and the testimonials of the riders – the value for money that the Boardman FS Team offers. It seems that What Mountain Bike were correct in their assumptions because buyers agree. It may not be to everyone’s liking when it comes to the style – specifically the questionable choice of white – but most people feel that the specification is top class, it offers a surprising amount for the cost of the bike and the final finish is professional and good-looking. There are numerous benefits to this Boardman Team and few negative factors, making it easy to recommend, but the most important thing to remember with this model is that is can re-energise a riders love of off-road cycling thanks to its quality features and performance. 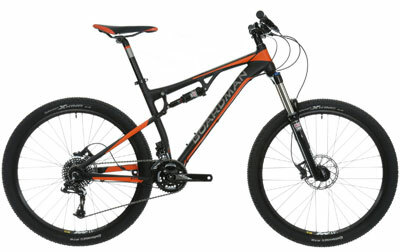 Find more reviews about this Boardman Mountain Bike Team Full Suspension at Halfords here.